had a great time staying there and especially the manager was of big help to us. we had some issues with our flights to lukla and he kept rebooking them and figured everything out. we had 2 great stays there! Shangrila Boutique Hotel is located directly in Kathmandu center. Around 150 meters from Mandala road, in the heart of Thamel. 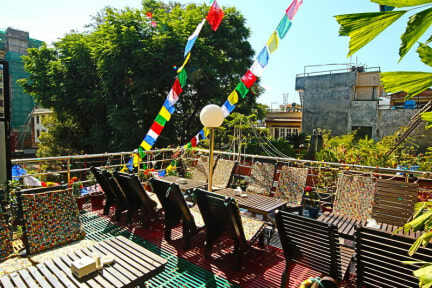 Placed in a quiet corner, just perfect to relax from always busy Kathmandu, providing a cozy terrace and lovely food. The hotel offers something for all budgets - from family rooms to double/single rooms, as well as dormitory beds - most importantly, the staff is always happy to help. Last but not least, the bathroom and showers are very clean and newly renovated! Sehr netter Besitzer, der einen herzlich in Empfang nimmt und auf Wunsch bei Buchungen hilft oder ein Programm ausarbeitet. Die Lage ist super, in der Nähe von "Garden of Dreams" und Thamel Innenstadt. Die Mitarbeiter sind super freundlich und jeden Morgen gibt es ein anderes Frühstück. This place is probably the best adress to stay for a few days in Kathmandu. It's in a central but not to crowded spot in the middle of Thamel, the touristic hotspot of the city. The rooms are cosy and good equipped with all kinds of chargers for your devices. The baths are western and mostly clean at all. I visited this place in the highseason and everyone was willing to help me and pretty calm at all. I highly recommend this place and will come back in the future. Good place. Quiet. Good location. Not too much young people around. Showers were hot. Missing a cheap laundry service and lockers. Rooms were dark and humid. I preferred the rooms in the Zostel. The showers instead were better here in the shangrila. Showers are really small, no space to put the stuff. Rather dirty. The rooms are locked by a card which is a pain, since you have to carry your card everywhere with you, even to the toilet. The place is hard to find since there is a big fancy hotel outside of Thamel with almost the same name, so take care where the taxi driver takes you. Rooftop was small and cramped and not cosy. There are better places in Thamel to stay, for sure.